From the raw vine to a fine wine, Copper Cabernet features freeform beadwork, machine embroidery, and tyvek that has been specially treated to create this luscious shoulder piece. 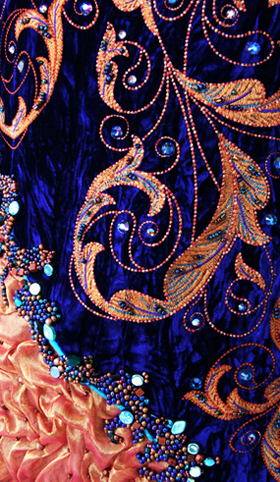 Ruching, freeform peyote beadwork and machine embroidery designs, highlighted with Swarovski crystals cover the dress. Awards: 2006 Bernina Fashion Show Top 10 Finalist, “Magnifique” Wearable Art Fashion Show.